One of many signs outside of Lawrence Barnes Elementary School urging voters to reject three gun control measures on the ballot. In the background are Ward 3 City Councilors Rachel Seigel and Vince Brennan, both Progressives, and Burlington City Progressive Party Chair Kyle Sillman-Smith. Burlington voters today overwhelmingly approved three ballot measures designed to tighten control of residents' access to firearms, setting up a potentially tricky decision for Gov. Peter Shumlin and state lawmakers in coming weeks. Residents voted 5,194-2,517 to ban firearms in businesses with liquor licenses; 5,579-2,066 to allow police to seize firearms after responding to domestic abuse incidents; and 4,351-2,971 to require gun owners to store firearms safely. All three changes to the city's charter will now be forwarded to the Statehouse — legislators must approve all charter changes. Shumlin, who has resisted gun-control efforts in the wake of the Connecticut school shooting, has refused to say whether he will sign the changes into law, and many legislators have been wary of wading into the gun-control debate. At polling places yesterday, supporters of the measures said they viewed all three as reasonable steps to improve safety for innocent people. "We need to restrict guns; it's common sense," Jeannine Mercure said. "Anything that would help to control accidental shootings, or circumstances in which people are agitated and have a gun — restrict all of it. Anything that would help improve safety is important." But opponents feared the measures would encourage officials to pursue additional encroachments on a cherished right. "It's a little bit at a time, and eventually, once they get their pinky in, they'll grab more. They're restraining responsible people," said Ed Rounds, who voted against all three measures. "I don't think the [advocates] know what they're talking about." Though gun-control issues are assumed to be partisan matters, many Burlington residents said they did not vote a straight ticket on all three measures. Chris Charuk voted for the domestic violence measure, which allows police officers to confiscate the firearms of an alleged abuser if they have probable cause to believe domestic violence has occurred. "If there's a case where police arrive at a call and they believe there's domestic violence, and somebody has a weapon that could be used against someone else, I believe they have a right to confiscate it, at least for a short time while the situation is worked out," Charuk said. But he voted against the other two measures, saying that bar owners and private citizens should have easy access to guns to protect themselves. "Sometimes, there's not enough time to get to that locked weapon and defend yourself," said Charuk, a Colonial Square resident. "Just in my neighborhood, there's been two robberies. I've had drunk college kids pounding on my door at 2 a.m. People have the right to have a firearm." The gun-storage charter change requires gun-owners to either lock a firearm inside a safe or use a gun-locking device on the weapon. 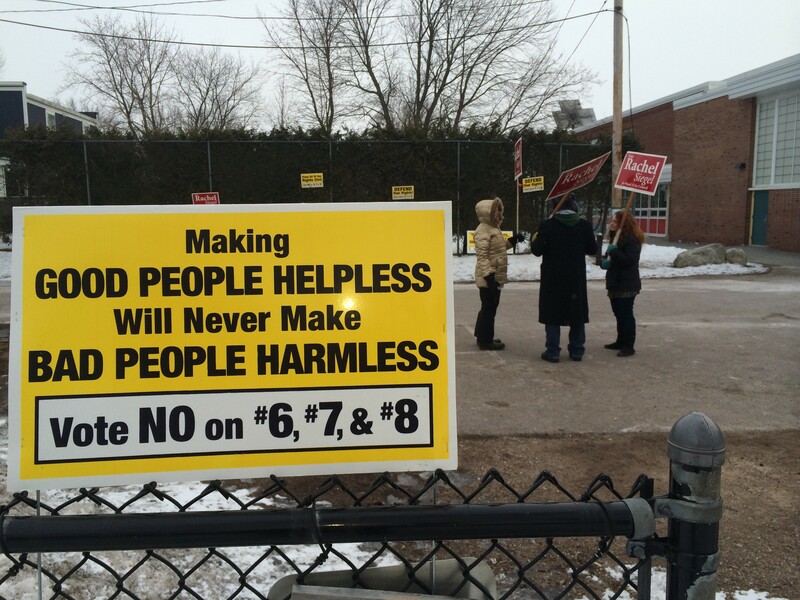 In recent days, yellow signs sprang up around the city urging voters to reject the measures. Their messages included "Making good people helpless will never make bad people harmless;" "The victim is the first responder;" and "Keep all of our rights civil." Emma Rosenzweig said she threw away a sign that had been placed without permission at the home where she is staying. "It's really important, it can save lives," Rosenzweig said of the gun control measures. "I don't think anyone thought to put up signs saying 'Vote yes,' because it seems so obvious."